It was not a good day for Meredith though Hurricanes won the game. Sometimes, cricket can be too cruel. Australian pacer Riley Meredith got a taste of the game’s harsher side on Thursday during a game in the ongoing Big Bash League (BBL) when he ended up conceding 17 runs just in one legal delivery. 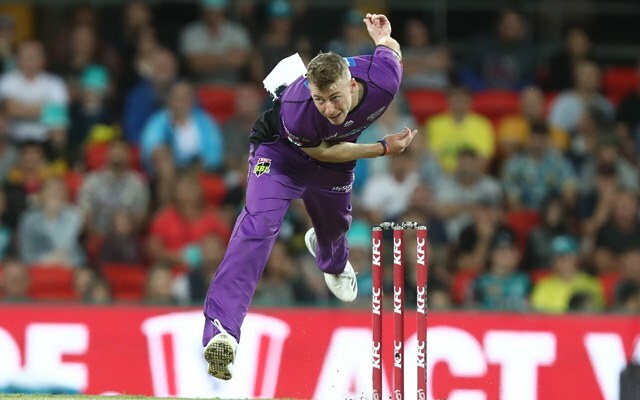 The Hobart Hurricanes bowler was left disappointed by the show even though his side eventually won the game by 16 runs over Melbourne Renegades. It was the final home match for the Hurricanes in this BBL season and they put up a score of 183 for 6 after the Renegades won the toss and elected to field. Meredith then came to bowl the first over of the Renegades innings and it went completely haywire from the fourth delivery onwards. The 22-year-old Tasmania bowler started off with a lot of pace and gave just one run in his first three balls. He then overstepped in his fourth delivery bowled to Renegades captain Aaron Finch and then in the free hit that followed, bowled a wide ball down the leg that was missed by the wicket-keeper and went for four runs. Riley bowls the next ball but that was a no ball again and hit by Finch to the fine leg boundary, thanks to an inside edge. The next ball was a clear hit to the mid-off boundary by Finch but to the fielding side’s shocker, Meredith had bowled another no ball! The free-hit saga continued into the next ball and this time, Riley Meredith managed to produce a legal delivery as Finch dug one out to the leg side and complete a fast single. The next delivery also went for a run as Marcus Harris played one down the deep third man. There was a mix-up but the throw went to the wrong end. The next ball again went for four leg byes and the keeper couldn’t stop the one angling down the leg side. Overall, 23 runs came in that one over. Meredith ended up giving 43 runs in three overs in the match and took one wicket. His opening partner Jofra Archer did a lot of make-up by conceding just 19 runs in four overs and taking 2 wickets. The Renegades finished at 167 for 8 in their allotted 20 overs and this win meant the Hurricanes will end up as the league toppers with one more game to spare.